Hey there folks, Godfrey here bringing you something a little different. Because of personal reasons, Corvus and Heretic have opted out of the topic, which I will honor without fault. However, I have quite a bit, both good and bad to speak on in terms of what this codex really is, and it's uses... even if they be few in number to most. Hopefully this podcast will promote some thoughts on how to look at this book past the first impression of WTF GDUBS!?! It's a long talk, but I hope it's something you guys can enjoy. 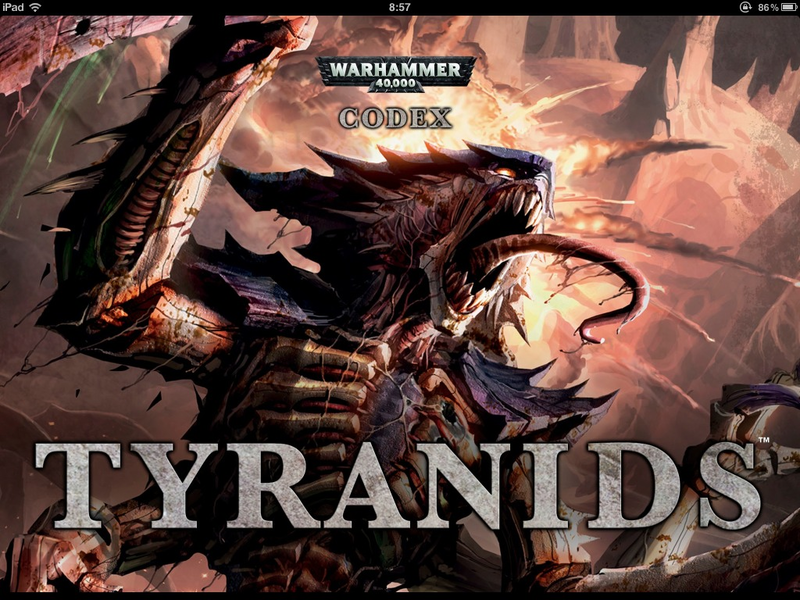 After the first half hour, my only real comment is, it is not that this codex gives more variety for an army, it really has just as much as the 5th edition book, it is that it FORCES variet, because it has so many subpar units that you have to force in to try and make things work. For shadows, it has always been 12". For 4th it was 3D6 take the two highest, but enemies were immune to perils (since it blocks out the warp, duh). In fifth, it became 3D6 add all, this mirrored eldars old rules. Now you are correct, it still stops almost as much, but also has less a chance for perils. 1 hour mark, the problem with fex's is that they are still preferable to be gun beasts, and so Feed basically ruins 150 point models. Also, if you run them as a squad, then they are subject to 1-3 IB, granted the few S9 AP- wont do much, but it still stops them from functioning. My problem is with the mawloc, you want to try and mishap with it. 50% of the time on mishap, you go back to reserves. So start turn 2, you can be doing 2 S6 blast a turn, and since it never comes onto the table, it cannot be countered by any means. The only counter to it is to pray to the dice gods that it scatters off, or it rolls a 1 on mishap. I could pick up the codex and still do just as well as I did with the last codex, which was pretty darn well. But I'd still hit limitations at the bigger Tourneys like I had before, and that s just poor design. Even in friendly games, I still have the huge army flaws I'd have to work around, which basically means bringing my monobuild tourney list to those games, which leads me full cycle to being just as much fun with my old tyranids. I either am smashing someone's army who can't handle MCs, or I'm getting tabled turn 3 because someones army can handle them. Very carefully read the Mawloc's ruling on how it is placed. It doesn't say you center it on the blast marker anywhere. It only stimulates that it must be placed on the marker. For the sake of argument, I'd wager the marker is the center of the blast... but again, there is nothing that says that. The "marker" could simply be the entire blast template. This means you could place the model with the edge of it barely on one side of the blast, and still be fine. Additionally, not only do you get a second change if you roll poorly, but you can be placed within 1" of an enemy model. So long as you are not in base to base contact. I highly doubt with all of the forgiveness in its wording that it will mishap all that often. Apart from that, it gets you a Monstrous Creature in their face and they need to deal with it. As for Pod tactics, yes I agree. Marines in pods is boring. My logic for why it is boring is because of the following. A. It is simple to do, and doesn't require much from a player. It's very little risk for a lot of reward. C. It is so common to see that tactic that it has become stale. So many people do it, that it isn't original or all that fun to see. It's boring because it's the predominant play style of many a Pod-using player, if not all in the competitive scene. Removing the pod option, while not expressly fair to Tyranid players (I admit that), does at least make for alternative options to be considered. Is it better codex design to have something like that available... thus making it "better" and therefor always seen, thus leading to what I feel is a boring unit design, than it is to provide the challenge of seeing how people opt to use them, or alternative means to netting similar results? That's entirely based on player opinions, so there is no right answer, but I hope it puts insights as to why I feel it is boring, at least to myself. I still make several mentions that this is a very poor update. I'm not arguing that Tyranid players don't deserve to be upset about things. I can see why it may come off that way, as I'm trying to go through the units and look for options. I'm just looking to make the best of a sour situation, and honestly I feel a few things did get better. The Venomthrope's rework does in my opinion help a few other options in list design because of the reliable buff to cover on mass. That allows for a lot for several army designs, if used carefully and skillfully. But yes, the codex doesn't feel like it got the proper love that most every other one has felt. I can only offer that units may feel sub-par because they do rely on that synergy. If they didn't and were capable of playing completely on their own, then the army would basically play like other specialist armies. The units are very capable for their price points if they get to do what they are designed to do, and while they do need help from other units in the army, I'm guessing that's done out of design. They should play differently than Eldar or Marines who are based on a lot of units doing things by themselves. If every army played the same, it'd be kinda boring. This style is punishing, and does require more to play than others.... which is a bummer in a way. But I can at least see that it does provide armies out there with differing identities in how they play, and are played against. Not the best answer, but it's all I can offer. Regardless of the vague writing of the placement, ideally you will want to try and make your mawloc mishap. The most common I've seen is to place it slightly over-lapping a tank or droppod. Since they now are near impossible to kill with the mawloc blast, you will mishap after resolving your attacks. If you don't mishap and actually place on the table, you stand there getting shot/assaulted, and then have to burrow on your next turn, and then come up again the following turn. If you even survived that long. But if you mishap, 16% of the time it's bad, 33% of the time it isn't any worse than not misshaping, and the rest 50% you are not going to get shot at, or assaulted, and you get to skip a turn and just start blasting the enemy again. It is such a bad design because there is Literally no counter to it. It is just as bad as Doom was, and now you can take three of them. The main problem I see then is I don't see the synergy. I see things like, well if I rush my gargoyles, I might save my stealers a turn because I gave them a new target. But any army can re priotitize targets and save units. That doesn't make synergy, that makes tactical decisions. Synergy is using combos. Having one unit make the other function better. Marker lights, spirit seers etc. Hive tyrants had synergy, but no longer give out PE so ony have hive commander. Lictors try and do synergy but still aren't designed well enough. Venomthropes do synergy so yay. Tervigons lost all of their synergy as well. Prime attempts to do synergy, but costs more and warriors really dont need him still for the points. In 5th edition I could try and Paroxysm a unit, make them Ws1, and assault with gaunts. If I payed for the upgrades and was able to have a tyrant and a tervigon near by, then my gaunts had preferred enemy, poison, and furious charge. That meant hitting on 3+ rerolled, wounding on 4+ rerolled. And it took skill to get all these units within 6" and coordinate the assault. I honestly won't claim it's bad writing when people are just trying to "break" the rule by gambling on keeping the model off the table. If people are mad that it can kill you when they're trying to obviously misuse the rule, then I just can't feel that terrible for it. If used as intended, I think it works fine. Perhaps. They lost some options, no one disagrees with that. But they still have some of their core needs in there. Several armies out there will still have a difficult time dealing with the bugs.